Dinner the previous evening was great with abundant amounts of delicious food. We ate at 8pm and were thus in bed by 9pm. I slept ok but woke up frequently, as people kept coming and going and somehow someone always left the door open, so the noise from the kitchen came up to the room. Oh well, I woke up at 4:40, 20 minutes before the alarm was supposed to go off and quietly took all my stuff with me to pack me bags in the hallway. Only one person was already awake in the kitchen, but he prepared a delicious breakfast in no time. Sven came down 15 minutes later and we had breakfast. At 5:45 we were all packed and ready to go (after I had to put my wet shoes back on; luckily I had almost completely dried my only pair of socks underneath the blanket during the night). We put on the headlamps and went out into the darkness and cold. Sven was in the lead and headed immediately towards the river. I said that we should cross higher up at the aqueduct as I had seen people coming back that way the previous day, but he was too far in front of me and did not hear me. But it did not matter: The route we took made for an interesting river crossing (including a 1m jump from one large boulder to another, which is normally not a problem, but at 6am with only a headlamp providing light, quite interesting). The darkness was soon giving way to twilight and when we reached the first snowfield we were almost able to see what was ahead of us. I say “almost” because if we had been able to see clearly we would have gone straight up it towards the tracks left in the snow by hundreds of people before us along the regular pass. However, we did not see that right away, and instead had to work our way up (diagonally into the generally right direction) the fairly steep and fairly hard snow. The snow was too hard to kick steps into it, so I tried to choose a little sun cup or similar indentation in order to place my foot. It was pretty borderline (almost hairy) but fortunately after 10 minutes of this, we had reached (by accident) the regular trail higher up. By this time we had already passed a party of two, which had set out before us, a guide and his French client, who had paused to put on crampons. From that point on this snowfield (and various others through the day) did not pose any problems anymore. However, in the next boulder field, we lost the trail again. I took the initiative here and just went straight up the boulders with Sven closely behind. They were fairly large and I actually like this sort of boulder hopping. It is almost like taking a stairway up the mountain. After a while, however we were passed the boulders and the slope consisted of terrible scree, which was the opposite of fun. We traversed to the left, in order to gain more solid ground and also in order to move away from a headwall that we were closing in on and all the related problems of falling rock and ice near the base of the wall. The headwall actually separates the valley we had hiked up the previous day from the valley that lead up to the summit of Toubkal. By now we had switched off and stashed away the head lamps and we were again able to find the trail further to the left. Luckily, the valley was still full of snow (not too steep) and we were soon able to walk up all the way to the end of the valley on the snow. Other people had been here on previous days, which we could clearly discern from the tracks and we made use of their tracks to go up. At the end of the valley another headwall/steep part blocked the way to the area higher up, which turned out to be a plateau leading to the summit ridge. We used switchbacks to work our way up this steep section to the beginning of the plateau and reached it about 2hours after setting out. We were almost at 4000 meters and we could fell it. Up to this point we had hiked in the shadow accompanied by a cold wind that moved up the valley and over the plateau. I was glad for my gloves and woolen hat. When I reached the end of the plateau (and the beginning of the summit ridge) I stepped into sunlight. However, my plan of bathing in the sunlight and warming up some were fruitless as it was still very cold because of the wind. So, I moved around a bit while waiting for Sven and continued moving up as soon as he caught up. I put on all my layers of clothing but fortunately the wind lessened somewhat as we moved further up the summit ridge. 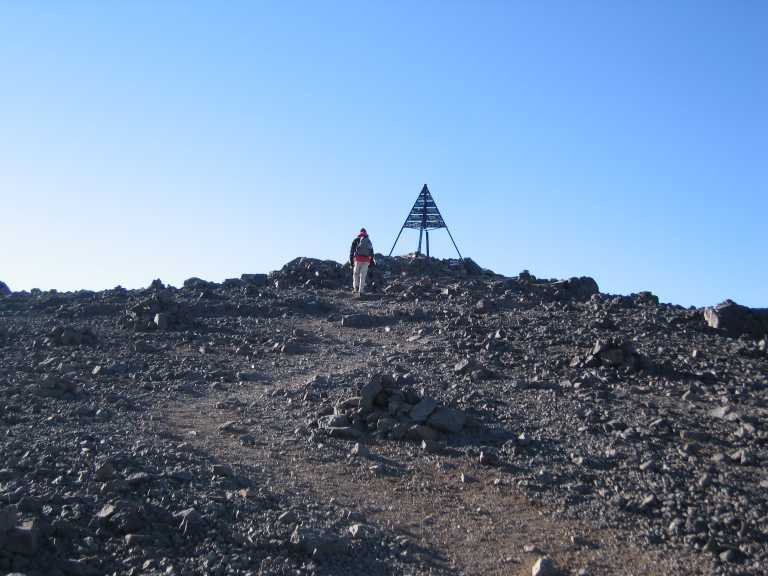 The summit was now in clear sight and we soon rounded on the left a sort of half-crater before reaching the slope leading up to the summit. It was now in clear sight, only 50 meters away and marked by a metal marker/triangle. We finally reached it at about 8:30, two and a half hours after setting out. It was still cold, but not as windy as below and therefore perfectly bearable. I was thrilled, as we were the first on the summit this day and we would have it all to ourselves. The weather was perfect, not a cloud above us. Actually all clouds were below in the valleys surrounding the mountain. We could see various other peaks sticking out of the cloud ocean. We congratulated each other and took various pictures of us and the surrounding scenery. I was able to point out the summits I had done the previous day and took numerous pictures of that as well. After about 10 minutes Sven began heading down. I had a few sips from the almost frozen water in my bottle and soon followed him. The descent was fairly straightforward and we made use of the snowfields as often as we could as the snow had already softened a bit. We also found the correct path and followed it almost all the way down. We passed numerous groups on their way up and stopped on occasion to chat a bit. Many groups had a local guide, which I guess is a good thing when wanting to support the local economy. We arrived back at the refuge at about 10am, and approximately 15 minutes after our arrival had another large platter of pasta, beans and salad waiting for us (and of course sweet tea). Have I mentioned that these people are very hospitable?? We chilled outside for a while longer after the meal, so that our shoes and socks could dry a bit more. While we were sitting there an eagle (I am not sure which type but apparently an endangered species in the Atlas mountains) was flying above the refuge, doing its turns without moving its wings once and getting attached by crows/ravens nesting nearby. Quite the spectacle and apparently not very common as all the locals came running out of the refuge and pointing at the bird. At 11 we headed down, reached Aroumd, where Sven picked up his bag at about 2pm and then Imlil 30 minutes later. While waiting for the taxi, we had a coke and talked with an old guide who had down Toubkal 215 times. Then we went out separate ways, Sven to join his family at a resort somewhere for another 10 days in Morocco and me back to Marrakech (in yet another Mercedes cab and in record time and the driver was cruising down the mountain at breakneck speed), from where I was to take the train to the Casablanca airport and then with a 1.50am flight to Frankfurt. My odyssey did not stop there, as I had to take the train for 3.5 hours to Osnabrueck in order to be at my friend Volkers’s wedding in the afternoon. I slept for a few hours a another friend’s (Rainer’s) house, but then partied until 6am the following day. Needless to say that I was “shot” for about a week afterwards. Quite an intense couple of days but worth it all the while.